Jean-Baptiste, or JB as he is cheerfully known, has returned to D&D London the luxury restaurant group with iconic restaurants such as Bluebird, Pont de la Tour, Quaglino’s and Orrery. After time away working first with Gordon Ramsay, followed by the Big Easy group and most recently Park Chinois in Mayfair, he is now enjoying his challenging operations director role with specific responsibility for 20 restaurants mainly in London but also in the north of England. We meet JB in the stunning German Gymnasium where breaking a sweat seems an impossibility, except maybe in the kitchen. It may be snowing outside, but the light-filled, stylish restaurant is convivial and welcoming, much like our host. When asked whether JB was ‘born’ to work in the hospitality industry, he recounts how he comes from Lyon (often referred to as the gastronomic capital of France) and surrounded by a family of chefs and restauranteurs. He saw both the hard work and the passion needed to survive in this environment and said that although his parents could have discouraged him, they simply insisted that he complete his education and that he get a grounding in the business of hospitality by attending a top training school in Switzerland. With that under his belt and his parent’s blessing he was free to make his way in the world and immediately headed for London! Overall, he muses, the formal education was important for him, but whether or not you have that advantage, you still have to start at the bottom either waiting or in the kitchen to learn the trade properly because it is such a complex operation. Thinking about complexity I wondered whether JB had noticed how discerning and knowledgeable guests have become about their food and drinks and how D&D London caters to their needs. “Customisation is a big trend now. People are becoming very picky and specific about what they like or dislike. The Americans are way ahead of Europe and the UK with guests demanding bespoke dishes and cocktails all the time. A breakfast for four for instance, can fill five pages of detailed description of ingredients and extras, cooking style and preparation methods. Everyone will want something different. Now this trend has crossed the pond and we can see people customise their orders all the time”. It’s the same with offering dietary options. We cater for vegetarians and vegans as a matter of course and alter dishes to accommodate other diets or allergies. “We have to, it’s obvious”. It is of course time consuming, expensive and requires expertise at every level but we are delivering an experience where the customer is King and this is why they keep coming back for more. A bespoke experience matters and JB’s restaurants are doing a lot of it. At the German Gymnasium, the drinks menu prompts guests with ‘The Artist’s Project’ where you can engage with the bartender in an intimate conversation about the flavours that take your fancy at that very moment or particular occasion, discuss your alcohol preferences and taste requirements, even the garnish you want in your drink and they will create a bespoke cocktail just for you. That’s the next level of customer service”. The team pride themselves in looking after their guests and giving them the very best. JB believes that although the major trends of provenance, health, premium are shaping the market, it is only by giving guests a unique experience that will make them want to return. “In the past good food, good service and a good atmosphere were enough...by providing those 3 you were on top of your game. But now this is just the basic of the basic. You have to do it.” This experience you need to offer may come from live music, shows, wine tastings, sushi masterclasses – just a few examples from what is happening in D&D restaurants this month. 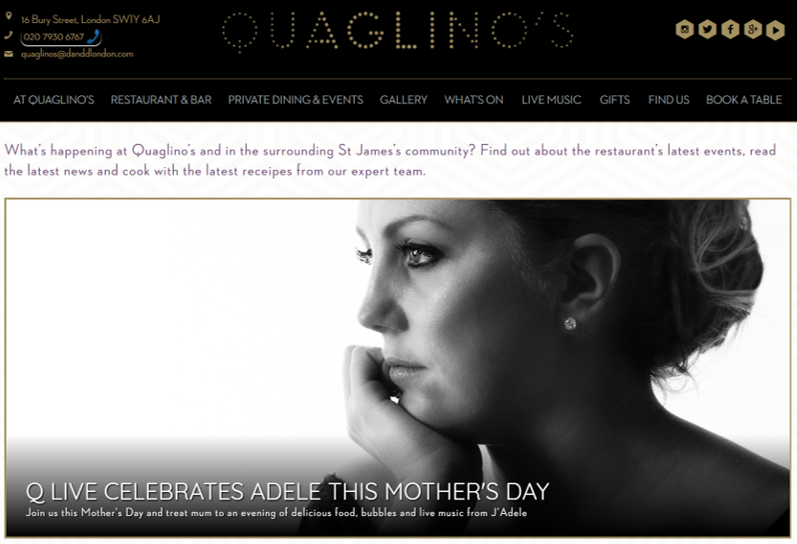 Clearly JB has tapped into the ‘eatertainment’ trend that we are seeing across the industry and you can enjoy the performance of top musicians in places such as Quaglino’s. There are so many things you can do to bring to the customer other than just food and service and JB believes that it is imperative to continue to innovate and be different. Ensuring that each individual is served in a unique way and that everything is synchronised to perfection is a tiring job for all the staff who must always be on ‘top form’. JB agrees and thinks of it as being ‘an actor’. Every performance matters and even if things behind the scenes are rushed, or a team member is ill, the guest only sees the smiles and still receives excellent service. After all, the hardest part of hospitality is dealing with people (guests and staff) and their expectations. Rather like a duck on a pond, on the surface you have to be smiling, calm and polite, but always paddling and working like crazy underneath. The trick is to make it seem effortless. We talk about whether this hard work and long anti-social hours take their toll on family life and relationships. It is still a challenge but JB thinks that there has been a massive improvement over the last 10-15 years with more flexibility for team members and better conditions. The environment in the kitchen has changed and today even Gordon Ramsay would not get away with the way in which he used to shout at his staff. Even so, everyone needs to take some personal responsibility for their work / life balance and make sure they are not working 7 days a week, that breaks are dedicated to family members and not the phone! As his parents did for him, he would also support his children if they decided that they would also like to pursue a career in this industry and had the necessary passion and determination. With a new restaurant opening in Manchester later in the week, the new Bluebird Café in White City and a couple of new restaurants planned in New York, there is plenty to keep JB busy and enthused within D&D. As he leaves for his next appointment I contemplate the breakfast menu and get ready to tell the waiter exactly how I would like my eggs and coffee this morning, knowing that it will be exactly the way I want it.